We're going to call it a night for our coverage on this page but be sure to stay across all of the action from the night session. Maria Sharapova is once again the main attraction on Arthur Ashe as she faces Sofia Kenin of the USA. There is also plenty of interest for the home crowd in the men's draw with John Isner and Sam Querrey due on court. Have a check of our tennis page in the early hours for our report from New York or stay across our latest scores page here. So that brings an end to the day session in New York. If you missed it, it was bad news on the British front as Kyle Edmund was forced to retire against Denis Shapovalov. Elsewhere in the men's draw, fifth seed Marin Cilic is out after losing to Diego Schwarzman. That means John Isner is the only top-15 player left in the bottom half of the draw. In the women's draw Garbine Muguruza and Petra Kvitova join Venus Williams in the fourth round. Venus Williams, speaking on court, is asked about her poor service game: "The best thing to do is to put it behind you. You can't change the past. That kind of game doesn't happen too often. "I'm most happy about winning. The last time we played we had such a battle. To win in straight sets shows playing good tennis. On her next opponent, Carla Suarez Navarro: "She plays a similar game to my opponent today - she's feisty, and really stretches you around court. I know I've got to come out and play well and have you all behind me." No we don't. Quite rightly Venus is happy to talk about her win. Anyway. Venus is up from her chair for the on court interviews. Will we get some baby news? "Game, set, match Miss Williams". The words we have heard so often. 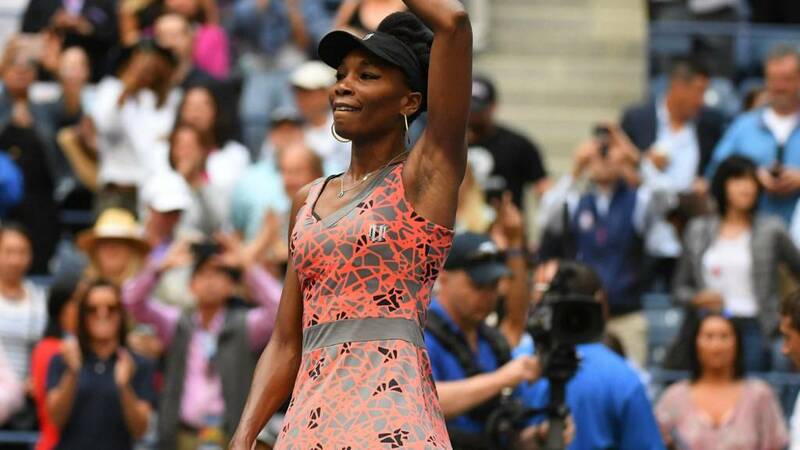 Not vintage Venus Williams by any means but she is through. Right. Up steps Venus. Can she hold off the service wobbles. Strong start. First serve in and Sakkari goes long 15-0. Another first serve. Not her fastest. In fact it is just 83mph but Sakkari nets. Maybe she was taken by surprise by the lack of pace. 30-0. Now the foot fault is back just as Williams goes for the big serve. Sakkari capitalises. 30-15. The crowd are making sure that Venus Williams knows she's appreciated. They want her to get the job done here. Can Venus wrap this up and get on the phone to her little sis? I'm sure that's what she'd like. Sakkari doesn't look like handing this to her though as at 30-30 she comes to the net to finish off a point. Now Williams nets. She's going to have to serve this one out. Finally we see some normality after three consecutive breaks of serve. Venus rattles through a service game to end the mayhem. We'll forgive her if she was a little distracted in this set given the circumstances. And the crowd get what they were after. She brings up a fourth break point and Sakkari goes long. The world number 95 is annoyed. She whacks the ball away in frustration after the line judges' call. She knows she'll never have a better chance to take a set off the great Venus Williams. The Williams grunt is getting louder and louder as she desperately looks to increase her advantage in this match. She gets to 0-40 but Sakkari does brilliantly to fight off the three break points. She just keeps hanging in the rallies and at the moment Williams is missing. "Come on Venus," shouts someone in the crowd. She needs her home crowd's support. Her box are up on their feet. It was good point construction from Sakkari. Venus and Serena are fairly quiet but when they need that extra boost they get louder and sometimes for the lower-ranked players it's important to remind your opponent you're battling. Those emotional shifts can matter. And Sakkari takes the first break point! A lovely backhand down the line seals it. Mum applauds from the player's box. These have been a remarkable few games. Another double fault, Venus' eighth of the match. And now the foot fault problems return. Sakkari takes advantage on the following second serve. The ball was there to be hit and the Greek player takes advantage, whizzing a forehand cross court. Now Sakkari is inching her way to the net. A nice angle sets up the put away. This really is an odd match. Now Venus Williams breaks serve to love. One minute ago she was serving a game of double faults, now she's crunching backhands that are nearly knocking Sakkari back into the blue backboards behind the baseline. Will Venus let a break slip again? Venus is tentative on her serve after those errors. Just over 90mph (just I know!) with her first effort into the middle of the box but her opponent pushes a little too hard. There are just a few too many forehand errors from Sakkari at the moment, especially when Venus is struggling. Right. Can Venus Williams get a serve in play? Yes! Finally she finds the service box with a second serve after missing nine in a row. But now the forehand fails. It hits the top of the net. And again at 15-30. What has happened to the seven-time Grand Slam champion? I'm still in shock and so are the crowd. Venus tosses away a racquet after that previous game. It gives myself and every other club player up and down the country a boost. Even the pros do it. More errors off the Williams strings. Sakkari turns and clenches her fist to her box. Suddenly this match is interesting.